ΙΑSIS PHARMA successfully participated in the 15th 2-Day Educational Workshop on Functional Diseases of the Peptic System, which took place at Divani – Caravel Hotel in Athens, December 2 – 3, 2017. The event was organized by the Professional Association of Greek Gastroenterologists (EPEGE). The workshop focused on the diseases of the stomach both from a a diagnostic also from a therapeutic perspective, with special emphasis on newer methods and technologies. 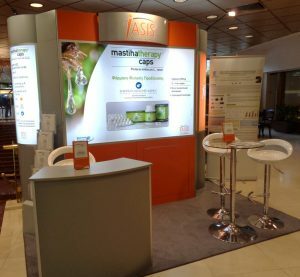 IASIS PHARMA demonstrated its active participation in the conference by presenting mastihatherapy® caps, the unique traditional herbal medicinal product, which contains 350mg of pure Chios Mastic used for the treatment of functional dyspepsia. Medical experts showed a strong interest about this herbal medicinal product, that is known to humanity for over 2.500 years, having several historical reports, but also many scientific studies published in the recent times. IASIS PHARMA is the only pharmaceutical company that is supplied with pure Chios Mastic directly from Chios Mastic Growers Association (EMX), ensuring the quality and authenticity of mastihatherapy® caps. The product is distributed only from pharmacies, in 30 & 90 caps packs, by pharma Q, an IASIS PHARMA company. During the event, IASIS PHARMA had a poster presentation, under the title ”Development and application of HPLC-DAD and HPTLC methods for quality control of Chios Mastic and Products”, written by V. Pachi, E. Kallergis, A. Angelis, V. Brieudes, S. Mitakou, M. Halabalaki, L.A. Skaltsounis. The presentation attracted high interest among the attending specialists by describing the method of detection for the unique ingredients of original Chios Mastic: masticadienonic acid and iso-masticadienonic acid, the substances that are responsible for the anti-inflammatory properties of the original Chios Mastic. The above methodology has been developed exclusively by IASIS PHARMA, in cooperation with the University of Athens, and certifies the originality of pure Chios Mastic contained in mastihatherapy® caps.